Alan Massie, the managing director of the city-based developer Carlton Rock, said the decision by council officers to grant planning permission in principle to the £200million expansion of the shopping centre could spell the end for the Granite Mile. Under the plans, which were approved earlier this month, Union Square will gain 30 new retail units and space for a 120-bedroom hotel, with a further 294 parking spaces alongside the already existing 1,119. Planning officers said the development would “promote vitality and viability” in the city centre, and create “opportunities for growth in the economy and overall retail experience”. 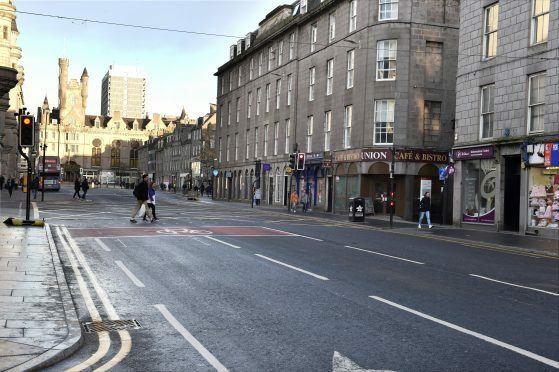 But Mr Massie believes the decision goes against the £1billion city centre masterplan, a 25-year project designed to rejuvenate and future-proof the heart of Aberdeen. He strongly believes the city’s main high street needs to be protected. A number of prominent businesses have shut down or moved their premises from Union Street in recent years – including the Waterstones bookshop, the expansive BHS department store, Eduardo Leather and the music shop Bruce Millers. He said: “I find it absurd that the council are fine with another huge expansion at Union Square, when Union Street is on its knees. “When you look at Union Street trying to reinvent itself with restaurants and a focus on the night-time economy, and when you look at what is being proposed down in Union Square – retail, leisure, restaurants and pubs – it’s like a mini town centre all on its own. “Union Street is our principal street. And although I’m all for a free market, as a planning authority there must be a joined-up plan for the city centre. Patrick Ritchie, the owner of the independent men’s clothing shop Signature on Union Street, echoed Mr Massie’s sentiments. He said that since he started the business in 1986, the local economy of Aberdeen has changed drastically – not just with the fluctuation of oil prices, but with the habits of shoppers. Mr Ritchie said: “I think the council should be championing Union Street, as opposed to Union Square. “To me, Union Street is unique and that’s where we need to invest, but there’s nothing unique about Union Square, you could find a shopping centre like that in any other big city in the UK. “When I read there would be 30 new retail units with the Union Square expansion, I really thought it was strange because when you walk up and down Union Street, there’s so many vacant units – so why is there a need for 30 new retailers? A spokesman for the city council said: “The decision to give planning permission in principle for the proposed £200million expansion of Union Square was taken in line with the council’s adopted scheme of delegation, approved by full council in March 2018. “Otherwise, both Union Street and Union Square fall within the identified city centre – as such, both have equal planning status in terms of locational preference, and are priorities for the council.